(l to r) Josh Leivas of Hugo, Jacob Stacey of Stuart, Chandler Smith of Wister and Amanda Melton of Talihina participate in Eastern Oklahoma State College’s annual Mud Bowl on Aug. 15 in Wilburton. The Mud Bowl, in which students play volleyball and tug of war in a mud pit, is one of Eastern’s many Welcome Week activities to help students meet new people on campus. 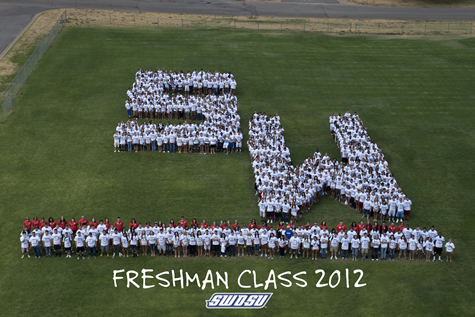 SWOSU’s 2012 freshmen class recently gathered for Mass Freshmen Orientation on the Weatherford campus and took time to pose for this class shot. Approximately 850 students were part of the picture. The New Student Orientation program hopes to make the picture an annual event on the SWOSU campus. University of Central Oklahoma students celebrated the fall semester on Aug. 21 by breaking the world record for the largest thumb war at "Thumbmania," a part of the university's Stampede Week activities welcoming students back to campus. Students broke the previous record of 846 participants with 872 showing up for the event. Guinness World Records will make it official in a few weeks.